Plastic sheet manufacturer and extruder in Janesville, WI. CaseIH dealer in Janesville. Features location, inventory, and product lines. Specializes in cabinetry design for both new construction and kitchen and bath remodeling projects. Janesville, Wisconsin. Manufacturer of nonwoven fiber insulation for the automotive industry. Division office and manufacturing plant located in Norwalk. Learn about this tool and die shop located in Janesville, Iowa. USA. Multi-national group of companies, active in molded or thermoset, nonwoven thermal and acoustic insulation and trim products for the automotive and transport markets. Part of Jason, Inc.
John Deere dealer. Equipment, parts, service for agriculture, commercial, lawn and garden equipment. Locations in Columbus, Hartford, Janesville, and Watertown, Wisconsin. Sand and gravel pit providing aggregates in South Central Wisconsin. USA. Custom designed needlepunch acoustical and thermal insulation fabrics for the automotive industry, from thermobonded reclaimed fibers. Also, polyethylene film laminated fabrics. Links to industry resources and related sites. Part of Jason, Inc.
Floral shop and greenhouse delivering arrangements, bouquets and plants to Janesville and neighboring communities. Includes information about national order transfer service and product care. Contains general and contact information, calendar, links to resources, first aid references, and pictures. Janesville-based team offers annotated roster, schedule, and links. Member list, photo gallery, newsletter, officers, contact information, calendar and links. Providing comprehensive hospice services to patients of all ages facing a life-limiting illness and their families. Madison and Janesville. Indoor street course with ramps of all sizes, mini ramp, spine, boxes and pyramid. Located in Janesville, Wisconsin. Raising dogs for herding, agility, obedience and conformation, or just be a family pet. Litter announcements, photographs, and rescue links. Janesville. Offers guided hunts for ducks and geese with prices and online booking form. Located in Janesville. Workshops, classes on yoga, reiki, psychic skills, meditation, metaphysics, emotional release, spiritual guidance. Located in Janesville, Wisconsin. Offers an eight-week class taught by a practicing dentist and staff in Janesville, Wisconsin. Includes session dates, a course outline, and staff credentials. Offers design, hosting, and database services. Based in Janesville, Wisconsin, United States. Offers ethernet jacks and one computer. Features menu and map. Located in Janesville. 23 Castle Rock BBS Janesville, Wisconsin. Janesville, Wisconsin. Centers on MajorMud, but also has games like PacDude, Backgammon, Crosswordz, and BBSopoly. offering services for personal injury and employment law matters, from offices in janesville. Janesville, Minnesota - Worship schedule, pastoral message, history, calendar, service study and fellowship opportunities, location, contacts and links. janesville law firm, offering litigation, business, family law, estate planning, municipal law, and real estate services. janesville law firm, representing clients in the areas of business and banking, real estate, environmental law, municipal law, estate planning and probate, and litigation. law firm, with offices in janesville, madison, monroe and delavan, handling the legal needs of local, regional and national businesses as well as the personal legal needs of individuals. 33 Trinity Evangelical Lutheran Church, Smiths Mill, Minnesota (WELS) Near Janesville. Near Janesville. Congregation shares a pastor and a web site with St. Johns Lutheran Church in Alma City. Location, schedule of services, map and directions, mission statement. This Anglican Catholic Church is located in Janesville, Wisconsin. The site provides contact information, a service schedule, historical information about the parish, and information on Anglican worship. uptempo electric guitar blues act based in janesville, iowa. site offers band biographical information, reviews, recordings, tour schedule and sound samples. SiteBook Janesville City Portrait of Janesville in Wisconsin. 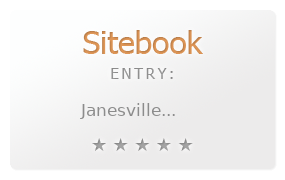 This Topic site Janesville got a rating of 3 SiteBook.org Points according to the views of this profile site.